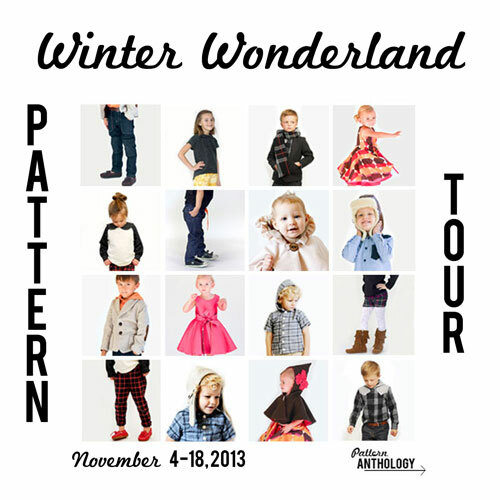 Have you guys had a chance to check out the Pattern Anthology Winter Wonderland Collection? It’s crazy gorgeous. I was so so excited when they asked if I would like to be a part of of their pattern tour. I’ve sewn with patterns from a number of their designers and just love them and these have been just as top notch. For my stop on the tour I’m sharing my version of Blank Slate Patterns‘ Amaryllis Dress. Yeah to getting the nieces’ Christmas dresses done early right? 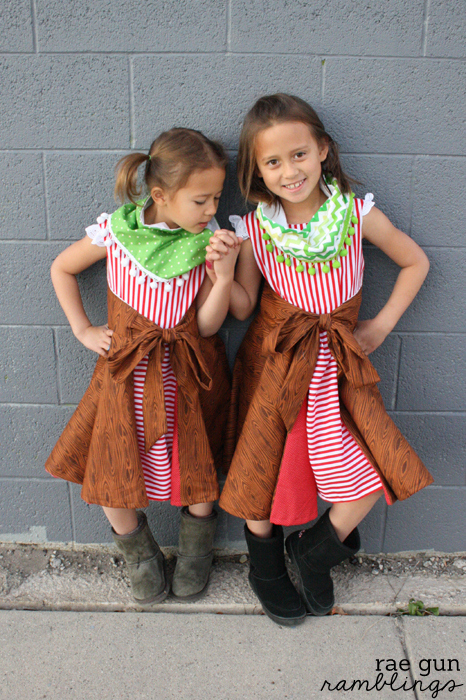 Not only am I sharing these darling dresses but I have a 10 minute pom pom cowl tutorial to share since I whipped those up to wear with the dresses. I thought it was fun to make them hold my Christmas Banner that I usually have up in the house. I’ve never been one of those decorate for Christmas before Thanksgiving but seriously the temptation is STRONG this year! Before I get to the tutorial here’s some shots of the different pieces in the Winter Wonderland Collection. They are being sold at a highly discounted bundle rate (full collection, girls collection, or boys collection) for a few more days (until 11/18) after that you’ll still be able to get the individual patterns but just from the different designers. I’ve had a chance to peek through most of the other patterns too and I can say they are all fantastic. I can’t wait to have a chance to sew them all up. See more of the tour at Melly Sews, The Train to Crazy, See Kate Sew, and Shwin and Shwin and at the Winter Wonderland Gallery. 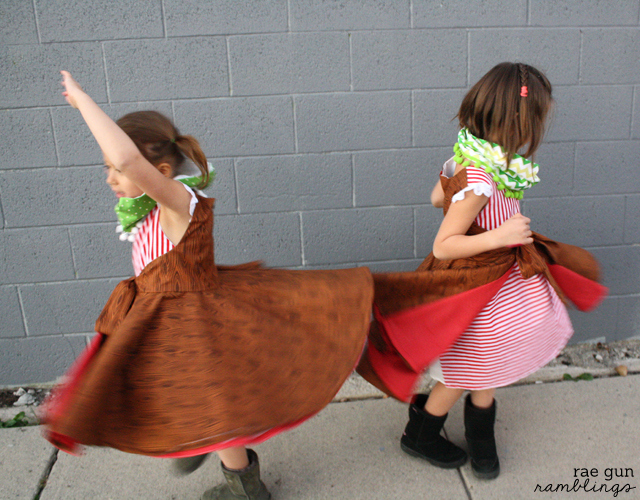 There are so many cool things about the Amaryllis Dress. It’s designed to be fully reversible. The nieces love it and were fighting over the one before I finished up the second. And once they put them on they both just started twirling it was so cute. But my favorite is the fit. I think this has got to be one of the most flattering dresses I’ve mad for the girls. Just go by whatever size matches your kiddo’s measurements and you should be good to go. There’s a lot of fabric but it was pretty straightforward to put together. 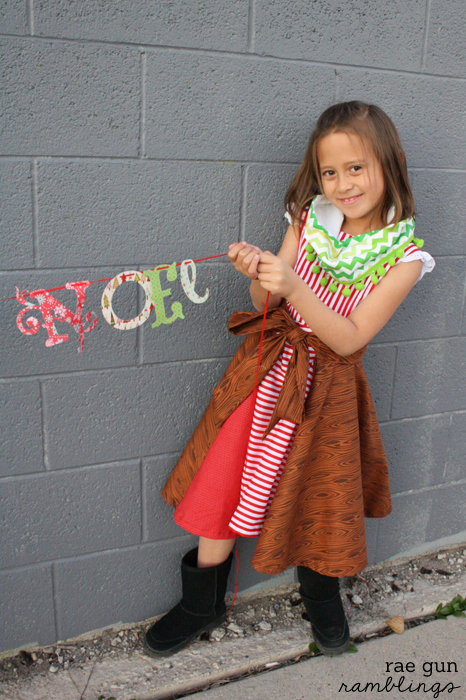 As part of the pattern tour the Anthology girls are having bloggers share a bunch of different things from sibling photo and styling tips, ways to customize the patterns, and scarves to coordinate. I love cowls because you don’t have to worry about them staying on or staying tied right and when it comes to kids it definitely reduces the hassle. Not only that but they are super duper easy to make and since you can make them out of almost an fabric super easy go coordinate with any outfit or personal style. With fabric right sides together sew down both long sides leaving a 1/2 inch seam allowance. Fold one end under about 1 inch. Tuck the other end in to form a tube and pin. Sew down to fasten the ends together. I like to use a zig zag stitch just since it gives more coverage so I make sure to catch the inside layer. Now you have a basic cowl. 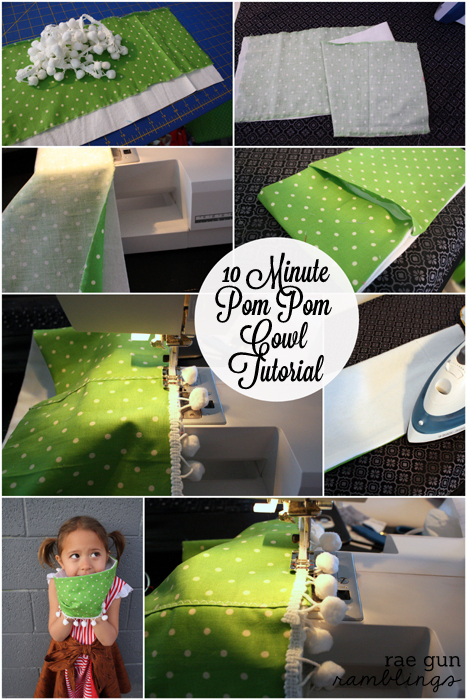 Pin the pom pom trim to the bottom edge on the outer side of the cowl and sew. These are so sweet! 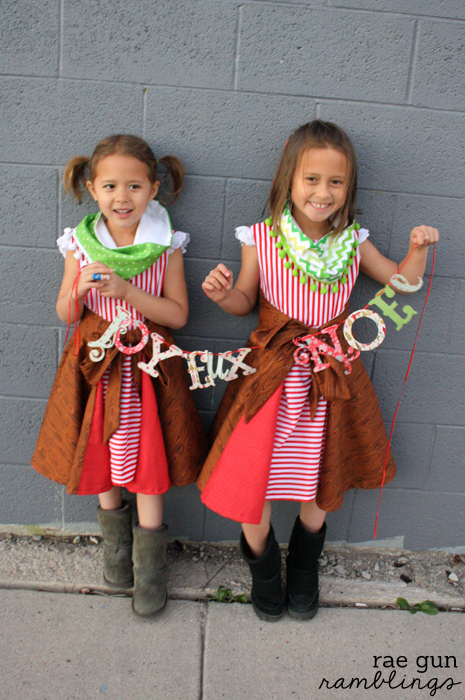 They look like Santa’s helpers =) Great, easy scarf tutorial! My girls would love the pom poms! Darling! I love those scarfs they are so so cute and they make the look! 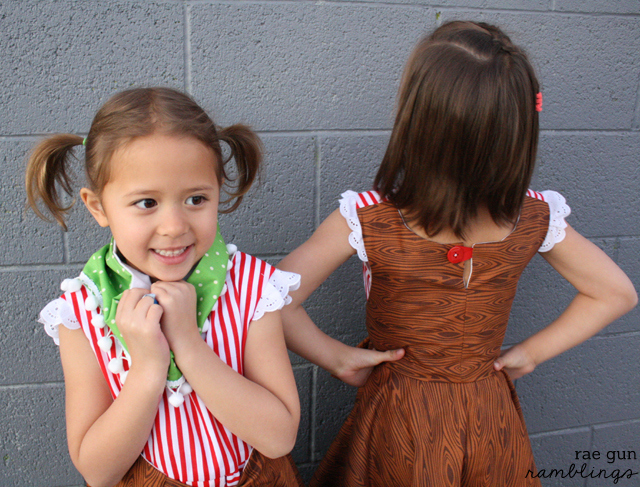 Love the dresses they look so cute! 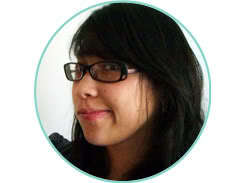 Love the picture of the niece peeking out of the cowl – so precious! I’m glad they like their twirly dresses too. Thanks for being on the tour. Oh I love the woodgrain fabric, how cool is that! and the scarfs are awesome! everyone loved this scarf!! 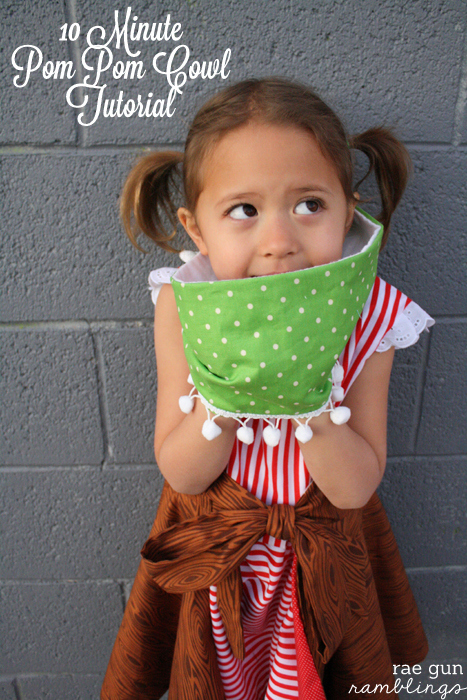 and the fabrics you chose are so awesome and christmasy! Thank you!